New type of platform 'door'? 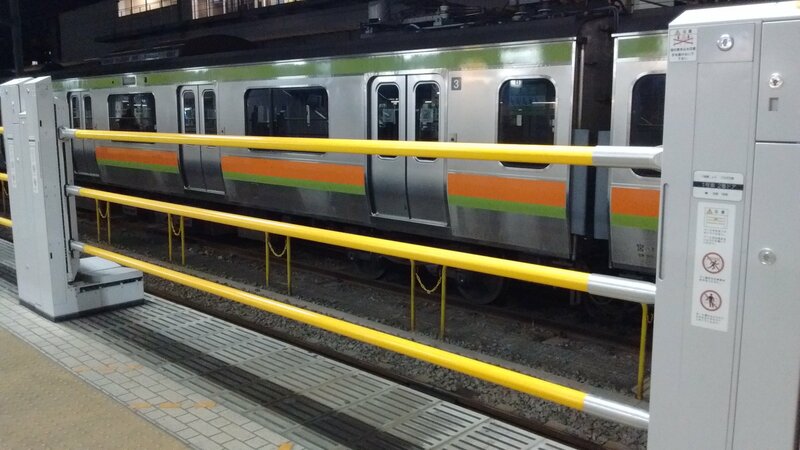 I saw this installed on the southbound Hachiko Line platform at Haijima last night. Looks very new. The bars slide upwards to open. I can see that this design uses much less material than the 'wall' design and could allow a wide variety of stock to continue using the platform, as a variety of numbers and positions of doors can be accommodated. Unfortunately this type can detect if you inadvertently put one toe over the yellow line (such as while taking a closer look at it) and relentlessly nag you to get back (only in Japanese, at least for now). It's been around for a few years, I think it's mentioned elsewhere on the forum but can't find the thread. So its an old prototype design that was abandoned in favour of the wall with horizontal sliding doors? I am glad that I do not have to worry about an infestation of whinging platform doors after all. It does seem an experimental one-off, at least for JR East, though I think I've seen similar used elsewhere, possibly Nagoya or Kansai areas. The one I’m most familiar with is the installation at Takatsuki Station on the Tokaido Line in the Kansai area. According to wikipedia, it was designed for platforms used by trains with different door positions. It's based a South Korean design, being introduced in 2004, at Nokdong Station on the Gwangju Subway Line No.1, where there is a vertical sliding full-sized platform door, in lieu of the conventional horizontal sliding doors used on the rest of the line (and elsewhere in the world, wich actually replaced the vertical sliding one in 2016). The Japanese verison comes in two different forms: the kind of the one at Takatsuki station is the earlier one, wich was initially tested from 2012 onwards (Takatsuki station being equipped with one in 2016) where the barrier is made of plastic wires, while the later one at Hajima uses rigid bars. Extensive testing of this new kind of screen door has been done, both in Japan and overseas, with many (such as SNCF at Banb-Malakoff station) considering adopting them, altough they're a bit of a flawed design: the eariler type wasn't enough safe (you may accidentally push the wires and fall on the platform) and the later one very unreliable and more expensive than the conventional sliding doors (due to it's internal coplexity and the high number of mechanical parts). Furthemore, they're unsuitable for underground stations, as they require a lot of vertical space. Finally, with rolling stock standardization in progress (as an example, JR West replacing 4-door three with 3-door ones), the need for platform gates accomodating different types of stock is gradually declining, thus JR and all the other companies planning to use platform gates, are going back to the conventional half-height horizontal sliding doors. Conventional platform gates were firstly introduced in Soviet Union in 1961, on Line 2 of Leningrad's Metro (today's Saint Petersburg). In Japan they were firstly introduced in 1974 at Atami station on the Tokaido Shinkansen, this one was actually placed a couple meters back from the platform edge to eliminate the need for extremely precise stopping. The first (full-height) glass doors on the hedge of the platform were first used in 1987 with the opening of the Singapore MRT. 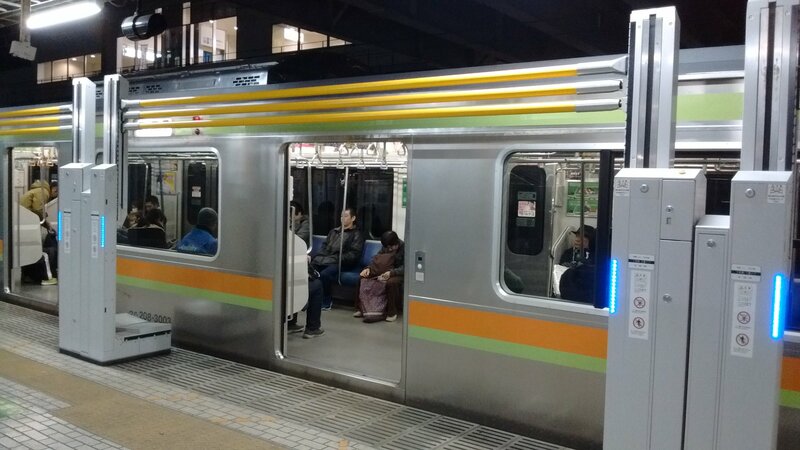 They were introduced in Japan in 1991 with the opening of the TRTA (today's Tokyo Metro) Namboku Line, while the first half-height ones were introduced in 2002 on both stations of the Kamiida Line of the Nagoya Municipal Subway. Added info about the Singapore MRT.